Just hoping the water will drop somewhat before I go back. I actually drove right through it, but just past there the water had washed out one side of the road and the rut was full of water with a log nearby. I was afraid to get caught up in it so I drove back through the water backwards and parked. That area is really quiet. 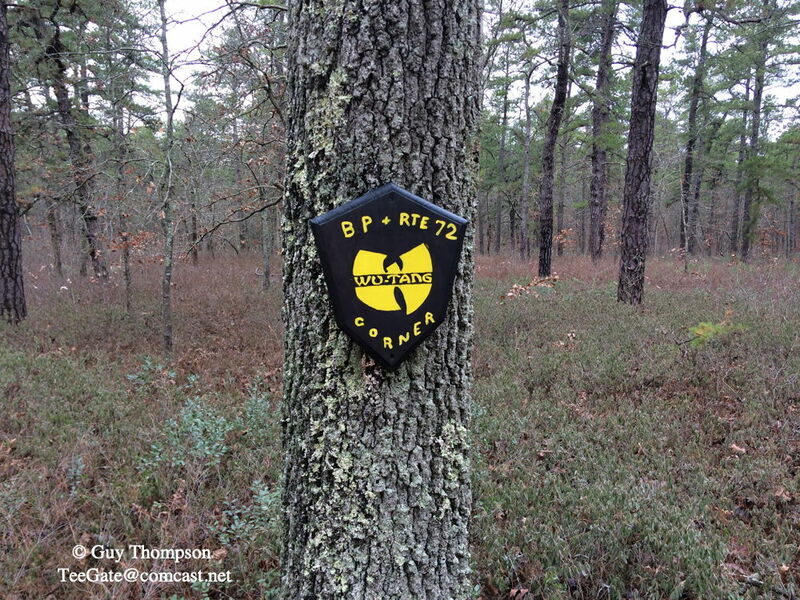 One of the most unknown area's in the pines. The only problem with it is there are plenty of briers in most area's. And the road is starting to close in because very few people go there. It is kind of isolated back there even if it is closer to civilization then much of Wharton.You either have to cross private property or wade the Nescohague or take the long tight drive you took to get back there. We were behind the Green Bank maintenance building yesterday looking for property corners but came up empty. Might give up on that location. Anyway, this shows the tree farm back there. We have a few real nice white pine groves down in Belleplain as well.One is quite large and nice but within earshot of 47.Another is quite small but back in the boonies and all you can hear is the wind through the needles. The nice thing about the big grove is it's old enough you really can't tell it was planted.The original lines are almost indiscernible. To meet increasing demand for tree seedlings, the Department of Conservation and Development has put into operation a new forest nursery with an ultimate capacity of 6 Million seedlings on the Green Bank State Forest, near Green Bank. For several years the department has operated a forestry tree nursery at Washington State Park, furnishing at cost of production seedlings and transplants for reforestation in the state. The demand for this material has increased year by year. Distribution of seedlings has grown from 70,000 in 1928, when the nursery was first opened, to 1,400,000 seedlings in the spring of 1931. 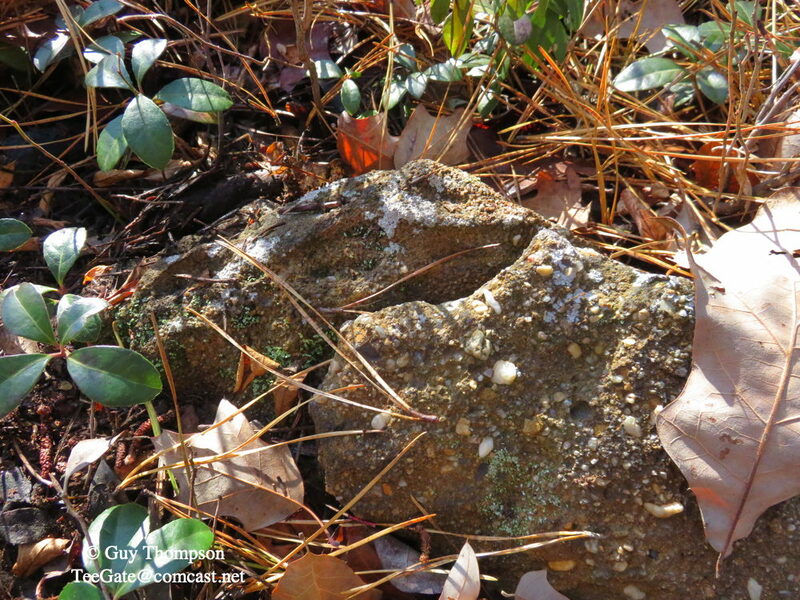 An attempt was made to grow all species of seedlings at the Washington Crossing nursery, but it was found that certain species of pines best suited for planting in South Jersey suffered from the winter conditions in Mercer County. The new nursery has been established to raise Loblolly and Shortleaf pine for planting in the southern portion of the state. At the Green Bank nursery a well has been drilled to supply water for the irrigation system of the 160 seed beds planted this spring. Because of the damage done to the young seedlings by deer, a deer proof fence is being erected around the entire nursery. C.F. Terry, who is in charge of the nursery, has taken up residence at Green Bank. I did not see the well but the fence and a gate are still there, mostly laying on the ground. There are canals built just outside the property and on the property the ground is leveled so that water can flow through the property. It would be interesting to know when this operation ended as I think it ended soon after the CCC ended. All of the trees there were from those seedlings. The Wick and Jon Holcombe like this. Traveled to Calico today searching for property stones. We came up empty. While in the area we searched for corners of the Oswego Tract and found this one. 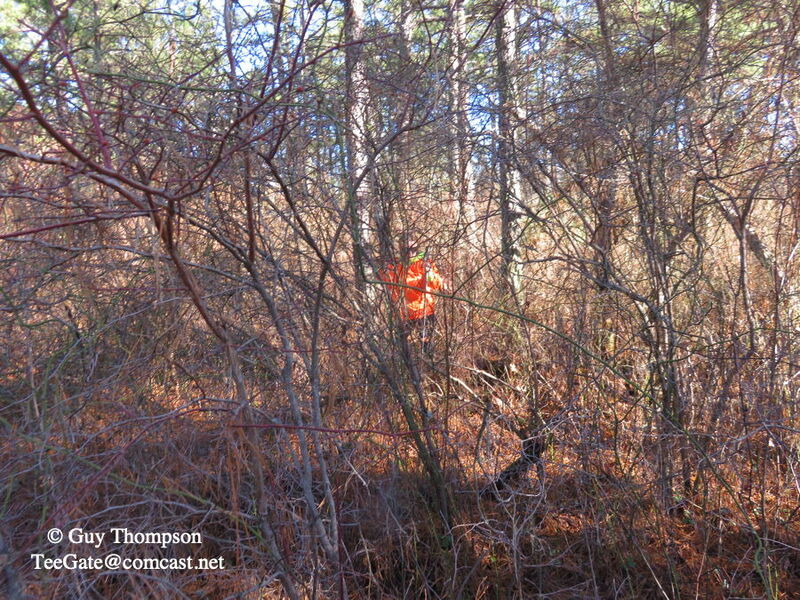 This is the NW corner of Lot 1 for the Oswego Tract which formally was called the Martha Survey. We then searched for the NW corner of Lot 2 and found that a fire cut had gone right through it. Nothing there. On the way home we again saw a bald eagle on Chew Road out in the field dining on an animal. 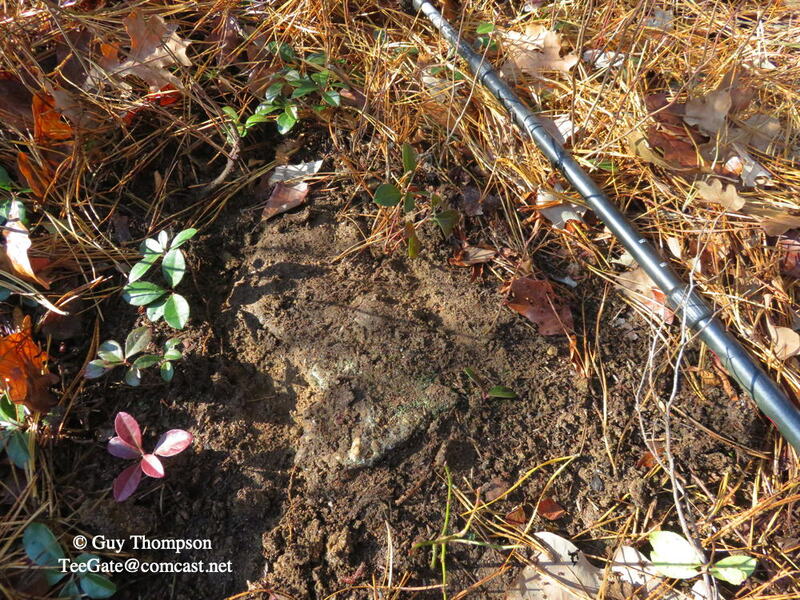 What are the odds of a fire break hitting a property marker or is it possible it was planned to mark the property line? It looks fairly new. 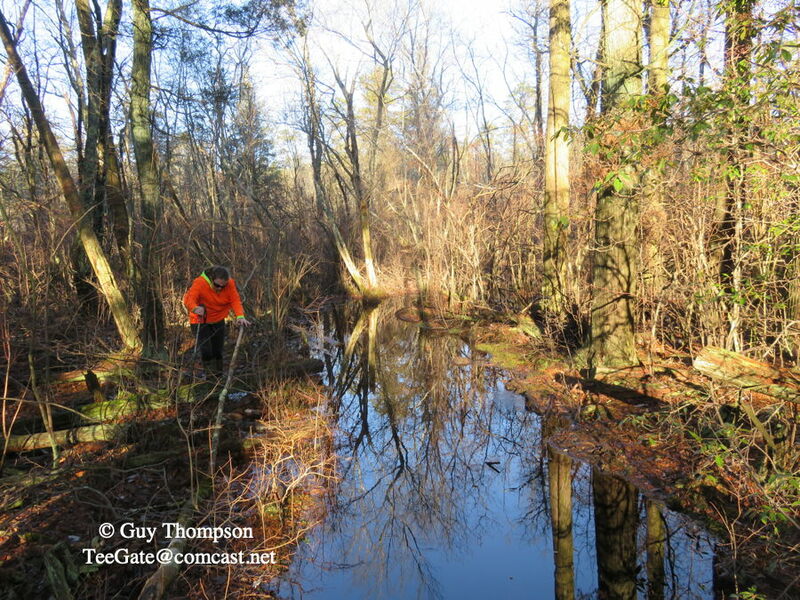 Jessica and I spent a few hours deep in the swamps along the Merrygold branch north of Stage Road this morning searching for a stone from 1776. The briers are unbelievable there and we are shredded right now. Anyway, we did not find it. But there was an interesting canal along an old property there that we passed through. 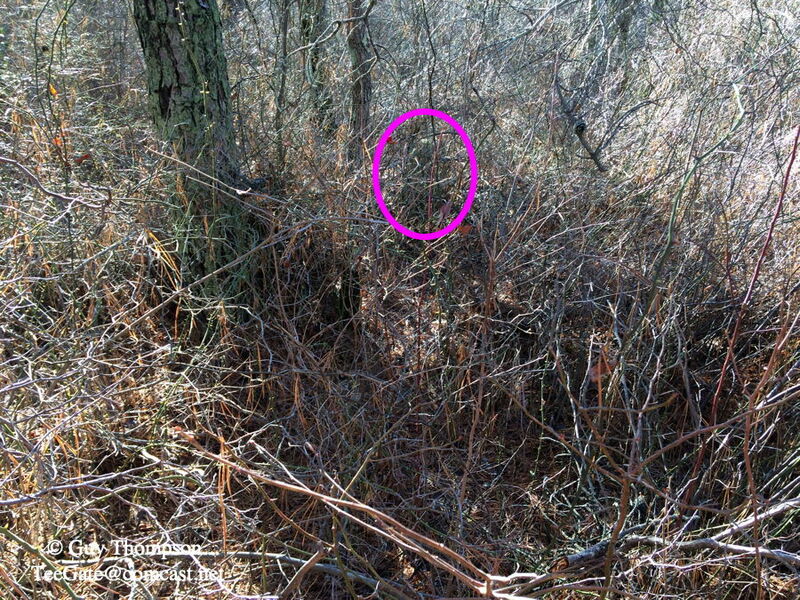 You can see the outline of the property here. 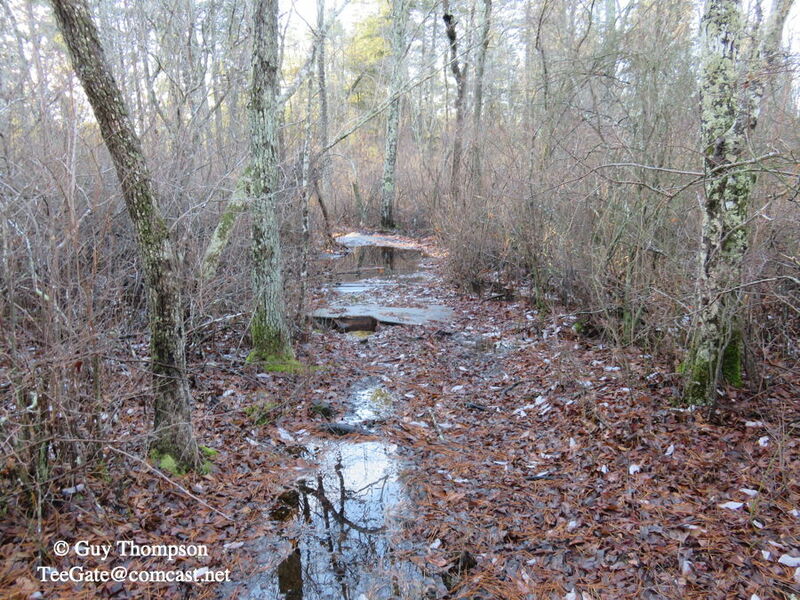 It has some sort of basin just before the stream. I pieced two photos together. 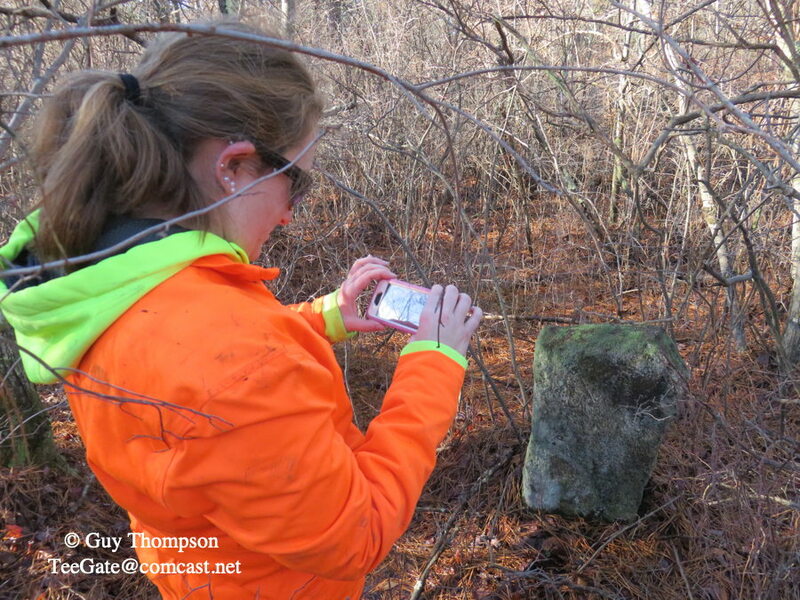 Member Rooftree told me about a monument he found along 206 that I had not visited. After looking over its location I believed it was a monument marking the beginning or the end of a curve in the highway and felt there would be another one right across 206 from the one he found. As I expected one was there. That stone along Merrygold I think you spoke of it a year or so ago.It was supposed to be inscribed wasn't it? Yes. 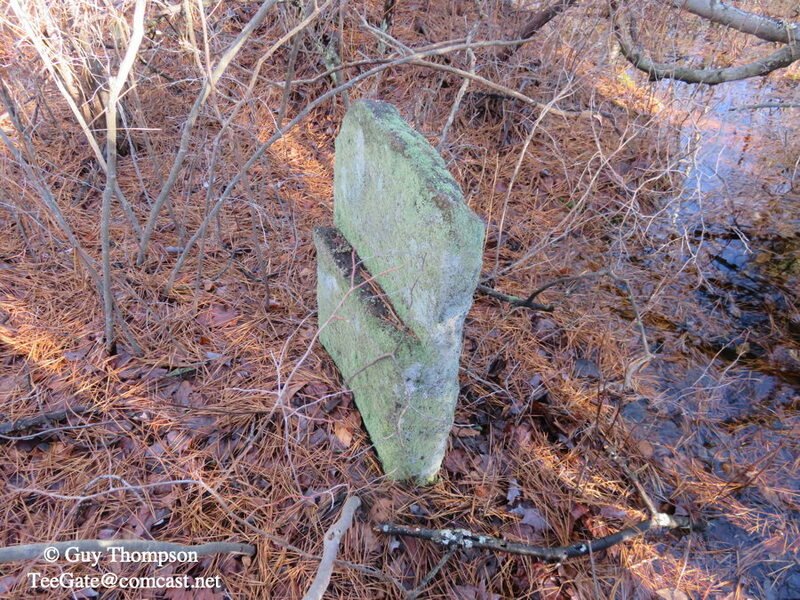 It is a TR stone for Thomas Reynolds from May 30th 1776. 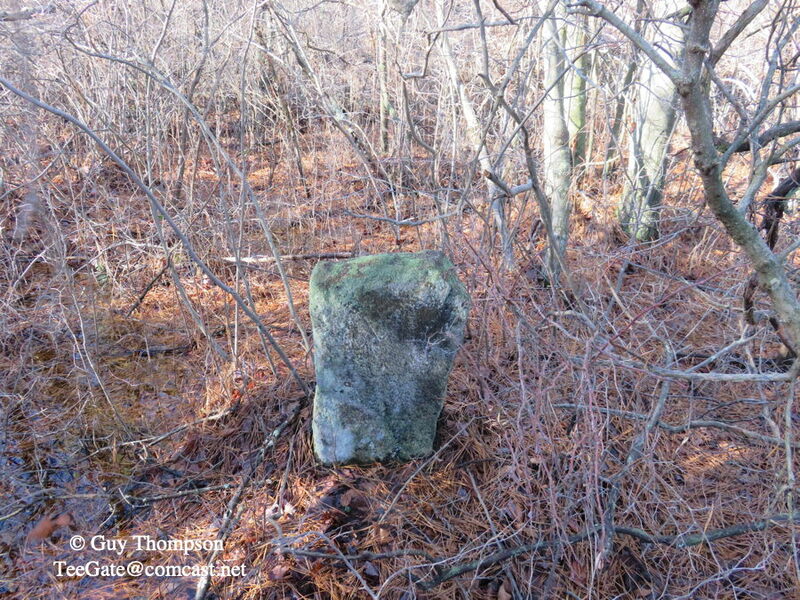 The main stone use to be on Allens Road and it currently has a monument that I found many years ago. That currently is covered over with dirt but I have the cords. So I know basically where they all are. You and I visited a few I believe but the lettering is gone. The problem with this location today is it is very remote and wild. Tough to get to and mostly briers right where I need to search. I could not see anything. The vegetation is taller than me and solid as a wall. No trash, no deer stands, nothing. Jessica and I wear orange and when I look back to see her I can't because of the vegitation. worth going in with some big pruning shears? Speaking of the Merrygold(?) Branch, I always wonder about this lake further downstream, and what they planned to do there. Looks like a housing development or a campground with plots for rent. This is all state owned now. It looks like a failed residential housing development to me. On tax maps you can see 'paper streets' and many approx. 1/4 acre lots. From the aerial view, it looks like they started clearing land for roads and lots, but then quit. 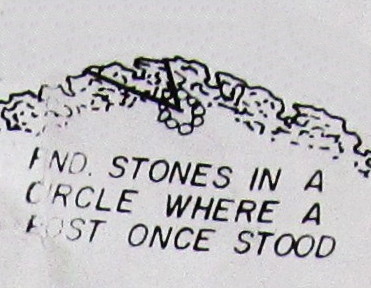 Quite a few years ago manumuskin sent me a map showing property stones in a circle and I have not visited until today. I was able to figure out close to where they were located and when arriving I was pretty close. How long ago they were placed there is unknown by me. It appears they have been there quite a while as many of them are cracked into pieces and are underground, with only a few surviving above ground. I had to carefully move the dirt just to see a portion of some of them. Here is a portion of the map showing them. The stones above ground stacked side by side. And below ground just randomly laying in a circle. John and bobpbx like this. Stayed home yesterday so I would not be shot. Today we stone searched all morning and put 13,500 steps on Jessica's Fit Bit along Oswego Road and Beaver Run. Came up empty. Very remote and quiet there today. 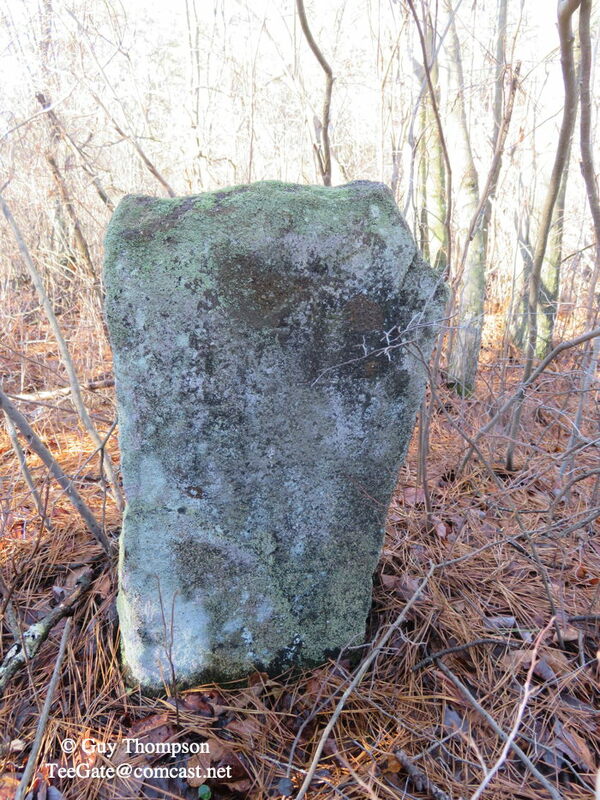 We did see a large stone right in Oswego Road but as of yet I can't figure out if it is a property stone or not. We saw one car right after we got out of ours on Oswego Road and that was it all morning. With the road being plowed I can't imagine a property stone surviving, however it is strange that a stone that size is even on the road. Is it near any property corner? Maybe it was at one time and is now where it got deposited? Maybe. I will work on trying to figure that out. 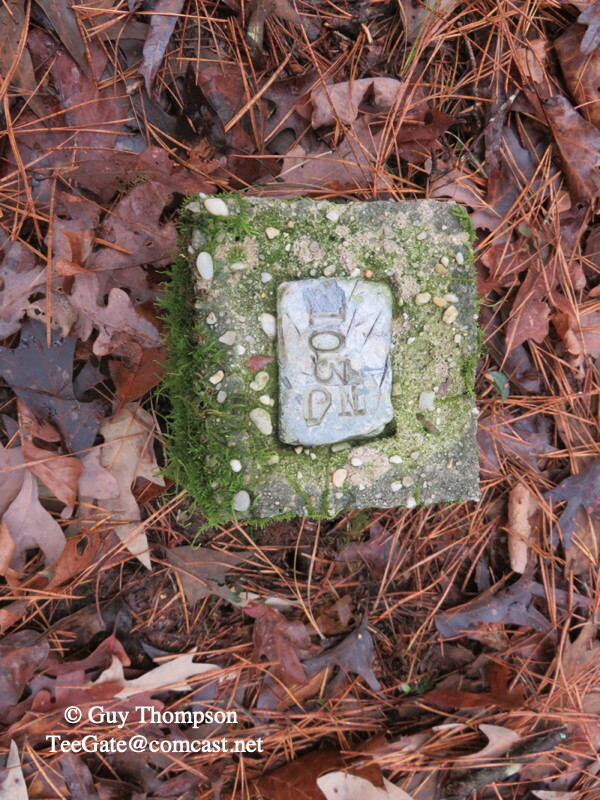 Was on the property where the Green Bank CCC camp was today but did not find any stones. 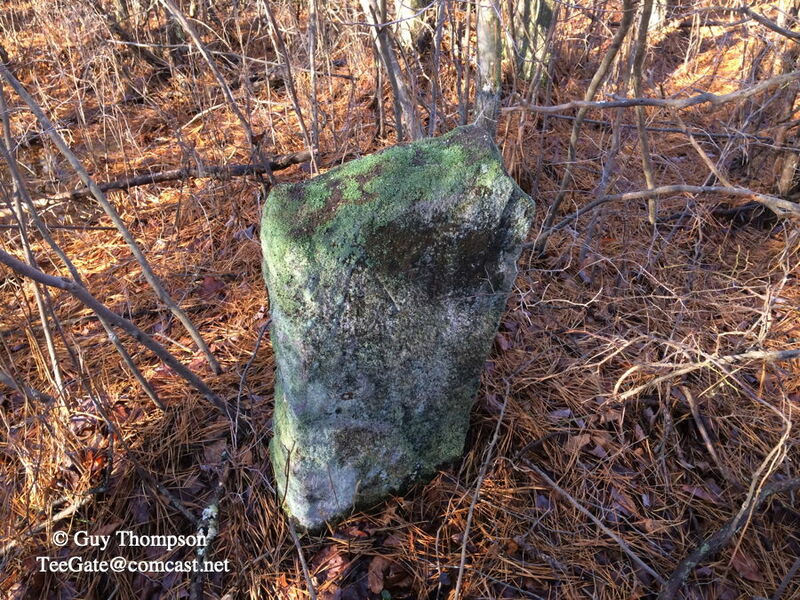 I did find one of the Green Bank state forest monuments that has been there since at least 1942. And while at Butler Place we saw this fairly new sign. The BP obviously stands for Butler Place. I suspect this is some sort of game that is going on. Anyone know anything??? 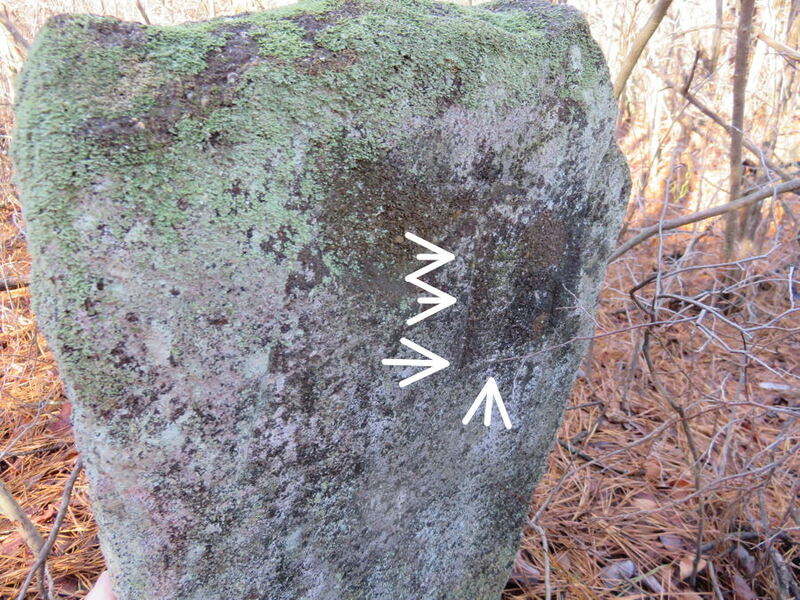 Some of you may remember a few years back when manumuskin and the two of us went searching for stones inscribed with the letters AL on them. Jerseyman figured out that AL stands for Arnie Lippincott who was the former owner of the Hedger House property until his death in 1859. Arnie's Mount was owned by him at one time and is named after him. Anyway, I have been working on finding stones in the same area and today was the first day that I have been actually able to do that. The rain and other obligations have been side tracking me. So this morning Jessica and I headed into woods that we have never visited before. Using aerial photo's I came up with a route that was acceptable to me and around 9AM we arrived. Traveling was quite easy at first until we came to this location where Jessica promptly stepped into the water over her boots and we had to remove them three times along our route to get the water out. 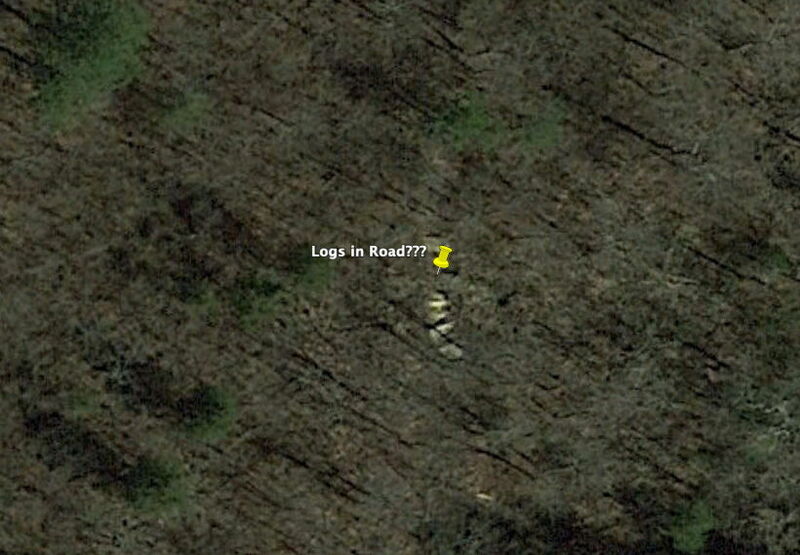 Looking over aerial photos before going I had noticed this which appears to be logs in a dim road. We traveled almost 3/4 of a mile and things started to get thick. Briers covered our route and we struggled to get through them. The blood was flowing quite heavy. Jessica struggling to get through. Eventually we made it and were greeted with another Arnie Lippincott stone with the letters barely showing ...but they were there. You can see the L in this photo. A side view. Looks like it is cracking. And it does wiggle somewhat. We then moved on to a second location a little over 200 feet away and we were deciding if we should give up or not. It was a struggle. However, we continued on and found nothing when we arrived. To be honest it was so thick with briers it could have been there. After much discussion we decided to continue on. We felt it could not get any worse. Another 300 feet and I saw something in the distance. And it was another Arnie Lippincott stone. You can see the letters much more clearly in this photo. Especially the A. So we know these stones have been there for at least 159 years, and there are more to find, as well as possible sawmills. We also know that this property in 1911 was again surveyed by Almer J, Earl when the property was apparently going to be made into a farm or development called New Jersey Farms. It is obvious by looking at the 1930 aerials the swamp next to the stones was extensively logged for the cedar just before that date, and Arnie may have done the same 70 years before that. If you have not viewed my posts about the previous AL stones you can read that here. RednekF350, John, Jon Holcombe and 1 other person like this. After looking at my tracks, I had the wrong waypoint location when going to the second stone. I bet we were 25 feet away from it which would make it invisible at that location. We must return.